The Thames Floating Pennywort Action Group is a team of Environment Agency staff from across our organisation that you have probably never heard of. But we have been quietly working, with invaluable help from local groups, members of the public and our own teams, to reduce the spread of Floating Pennywort, an invasive species, on the Thames and its tributaries from its source to Teddington Lock. Our Action Group members have a range of different skills and experience and we are all doing this work as part of our wider roles within the Environment Agency. I was fortunate enough to take over the leadership of the Action Group in the spring and my role involves working with our group and area staff to coordinate the Floating Pennywort management and surveillance work that we do. Although you may never have heard of Floating Pennywort you have probably seen it on our rivers or in people’s ponds. Since arriving in the 80s it has been steadily establishing itself causing a range of different impacts. Because it is fast growing (up to 20 cm a day in the right conditions) and establishes dense mats of vegetation it outcompetes native species, obstruct boats, prevents angling and can potentially increase flood risk. 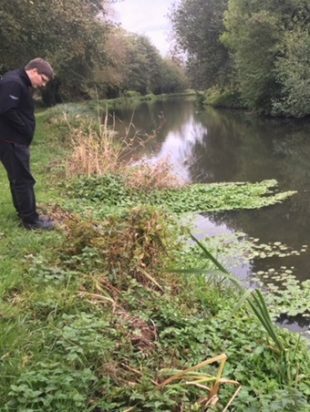 Although as an organisation we do not have to remove Floating Pennywort, we do have discretion to remove it under our statutory powers and we had been managing it for a number of years on some of the tributaries of the Thames. However the summer of 2017 provided ideal growing conditions which allowed it to spread with great speed and establish itself in the middle part of the river Thames. In response we declared a local incident and formed our Action Group to help us coordinate our efforts. 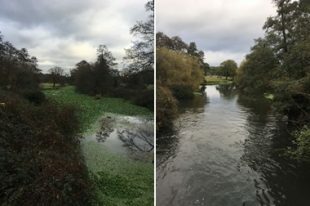 Early intervention is the best way to manage Floating Pennywort because it is difficult and costly to eradicate once established, and so from the summer through to the end of winter in 2018 we removed over 60 tonnes of the plant from the River Thames. Since the spring our staff, together with local partners, have carried out surveillance on over 200 km of the river Thames and its tributaries. 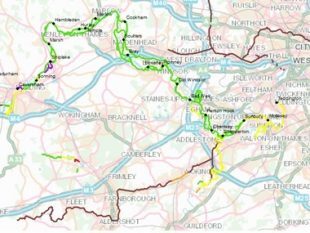 This has given us a clearer picture of the extent and spread of this plant in the Thames catchment so we know where we need to be taking action. The map below shows the stretches of river that we have carried out surveillance on and they are colour coded based on how much Floating Pennywort has been found. Since the spring we have also removed approximately 20 tonnes of Floating Pennywort from the river Thames which is a fall of 40 tonnes compared to the previous 6 months. This fall in volume is because our work has meant that there is less of the plant present in the river. In the Wey catchment, a tributary of the Thames, we have been managing Floating Pennywort as part of our annual maintenance programme for a number of years but this year we have dedicated more resources and new equipment to our work which has made a real difference to the growth of this plant. 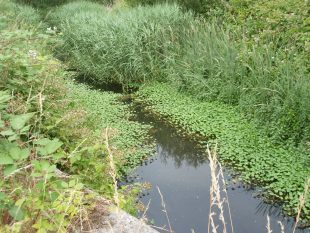 Alongside our work, across the Thames catchment local groups and individuals have been working together and with us to manage the spread of Floating Pennywort. In Reading the Reading & District Angling Association, Green Park Business Park and Canal and River Trust have been coordinating their efforts to control the spread of this plant in the rivers they share. Their efforts have improved the local river environment and reduced the risk of this plant spreading elsewhere. On the River Blackwater (which borders Hampshire and Berkshire) local groups, such as the Blackwater Valley Countryside Partnership and Loddon Fisheries & Conservation Consultative, have been working with each other and with us to manually remove Floating Pennywort and treat it with herbicides. As can be seen in the photos below this has made a real difference to the river environment. Without partnership work like this we will never be able to control the spread of this plant and we are hugely grateful for the efforts that everyone is making. Although we have had a really good year in the management of Floating Pennywort we recognise that we cannot rest on our laurels. Our Action Group has developed a long term plan and we, together with our local partners, will need to continue this work year on year if we are to effectively control the spread of this invasive species and ensure it does not return to its previous extent. The help of members of the public is vital for us to identify where Floating Pennywort is growing so if you see Floating Pennywort on the Thames or its tributaries upstream of Teddington lock please report it to us at enquiries_THM@environment-agency.gov.uk.